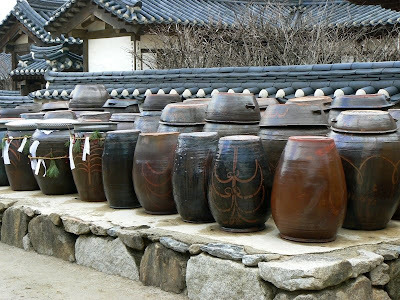 Jars for storing kimchi, gochujang and doenjang, three of the important staples of traditional Korean cooking. The photo was taken yesterday at the Namsan Hanok Village near Chungmuro subway station. It rained pretty much all day yesterday. 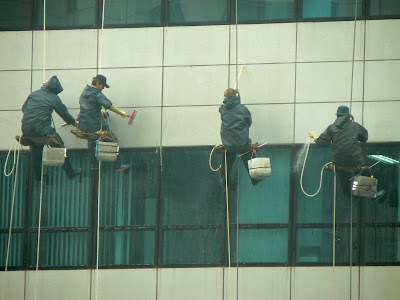 However, it didn't deter the four gentlemen above from cleaning, by hand, the windows and exterior of a building in Yongsan. 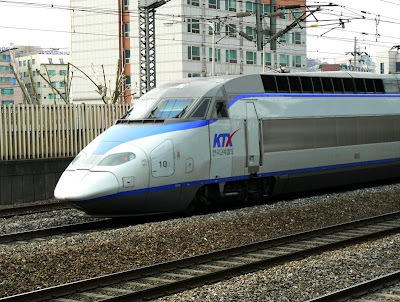 A photo of the KTX (Korea Train Express), the high speed train based on the French TGV (train à grande vitesse), leaving Namyeong station. The view from my apartment yesterday morning through a very dirty window (I had better get the Windex out on the weekend!). 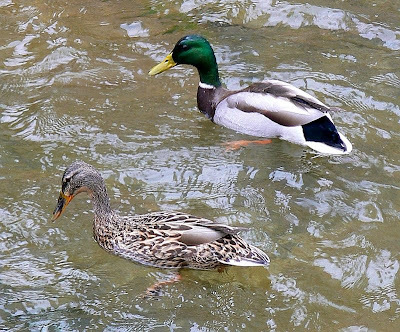 A pair of ducks paddling in Chonggyecheon, downtown Seoul. The restoration of the Cheonggye Stream is a remarkable story of urban beautification and renewal. 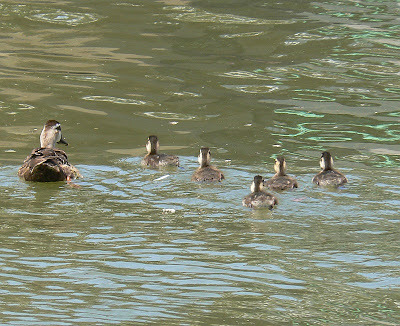 The stream draws big crowds during the warmer months. 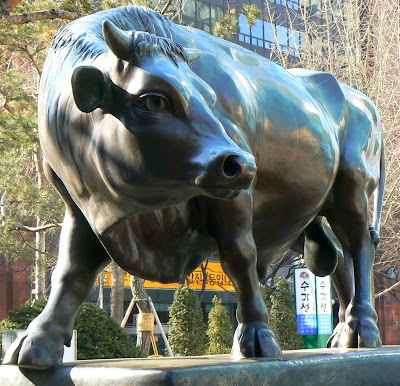 A near life-size sculpture in the business district, Yeouido. 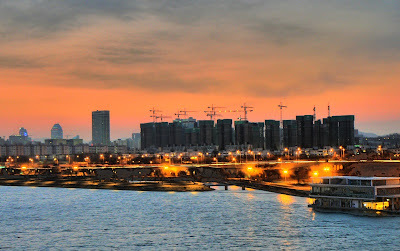 A view across the Han River to the 63 Building and rows of apartment buildings. 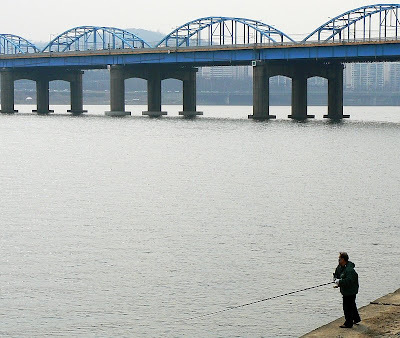 The southern stretch of Hanganggyo (Hangang = Han River, gyo = bridge) taken from Nodeulseom, an island in the Han River. 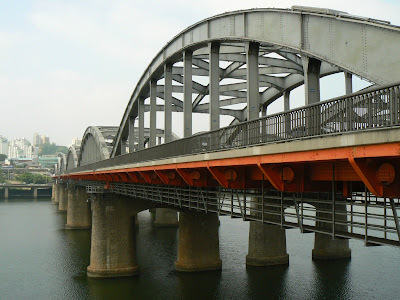 According to this article there are 27 bridges across the Han in the Seoul National Capital Area. I will try and post photos of some of these structures in future posts. 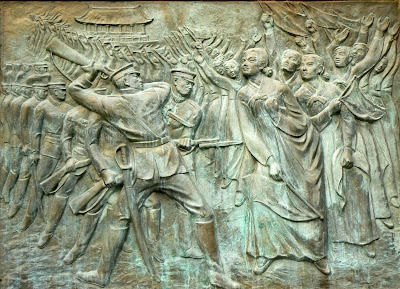 One of a series of large reliefs in TapGol Park commemorating the beginning of the independence (from Japanese rule) movement on 1 March 1919. TapGol Park was the first modern park in Seoul and is situated in Jongno-gu at one end of the Insadong precinct. It is also the site of National Treasure No. 2, the Wongak Temple 10 level stone tower. I had gone to the park to photograph the tower but it was was screened off from public view for renovations. 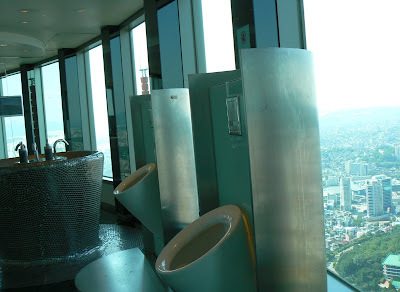 This is a shot of the male toilets on the observation deck of N Seoul Tower on Namsan. 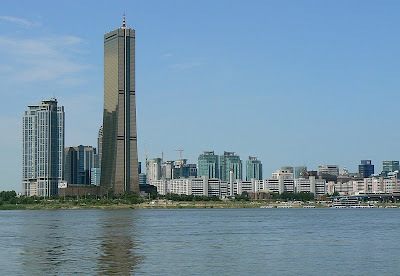 You can probably see that they also afford excellent views of Seoul. Why have I chosen to post a photo of toilets on my blog? Well, 22 March of each year has been declared World Water Day by the United Nations. 2008 is also the International Year of Sanitation so World Water Day '08 also promotes this important cause. The UNESCO Director-General's message for World Water Day 2008 can be viewed here. While I'm talking toilets, I can tell you that the public toilets in Seoul are among the cleanest that I have seen anywhere. If you're interested, you can view my other musings on the topic of toilets here. 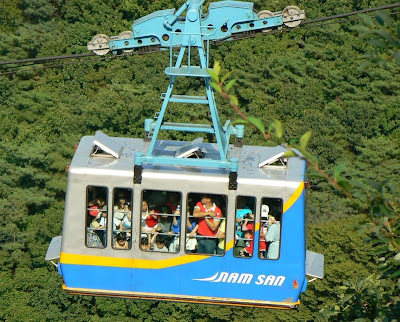 The Namsan cable car was built in 1962 and takes passengers about 600 meters from a station near Myeong-dong to a platform just below the base of N Seoul Tower on Namsan. I understand that it was the first commercial cable car service for passengers in Korea. I took this photo from an observation platform on the side of Namsan. I have not travelled in the cable car yet as there have been long queues to use the service when I have been there. On this particular day there appeared to be a lot of folks crammed into the cars. 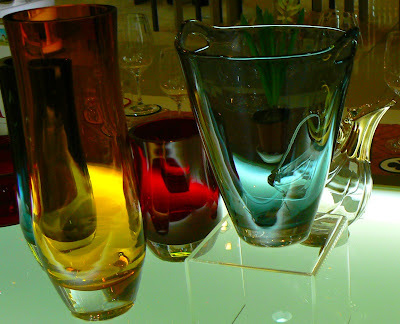 On the weekend we bought some wine glasses in a department store at the I'Park shopping complex, Yongsan. While waiting for them to be boxed up, I noticed this display and took a quick snap. 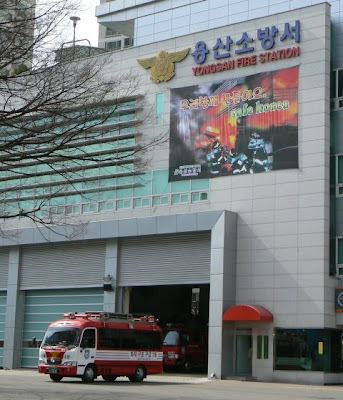 A fire engine parked outside Yongsan fire station. 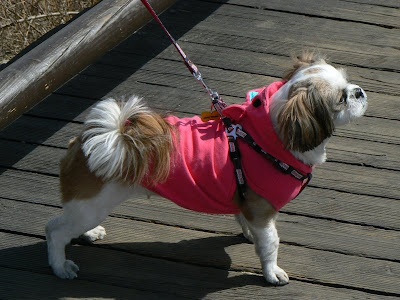 As many Seoulites live in high-rise appartments, those that keep a dog tend towards the smaller breeds. Their proud owners often dress them up like this one. Some owners also dye the ears and tails a lurid colour like hot-pink or lime green. 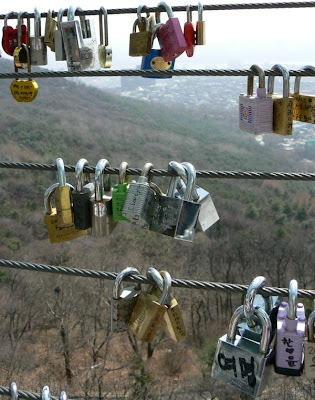 It has become a tradition for young lovers in Seoul to place padlocks (often two, linked together) bearing meassages of love along the steel cables around the external observation deck at the base of N Seoul Tower on Namsan. 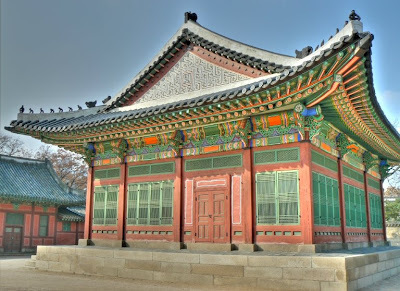 Here is an image of one of the halls in Deoksu Palace, near Seoul Plaza. This was made by combining three bracketed exposures. 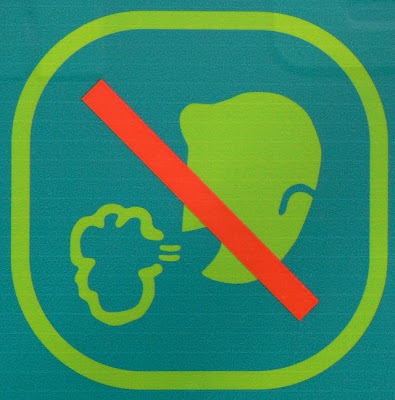 A strange sign at Youido Park. 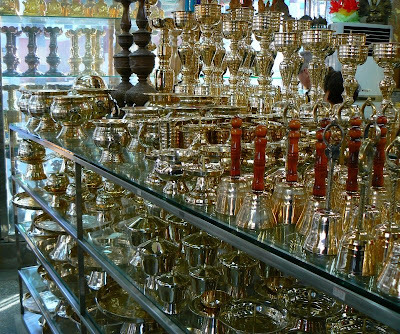 Brass ware in one of the Buddhist shops near the Jogye-sa Temple, Gyeongji-dong, Jongno-gu. 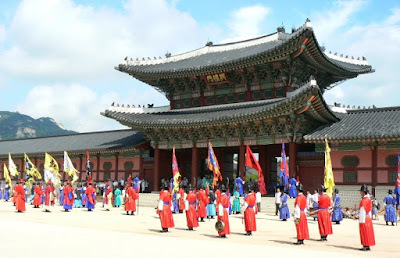 Changing of the Guard ceremony at Gyeongbok Palace (Gyeongbokgung). 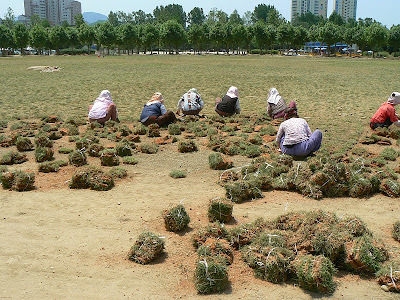 Women laying turf on a playing field at Boramae Park. 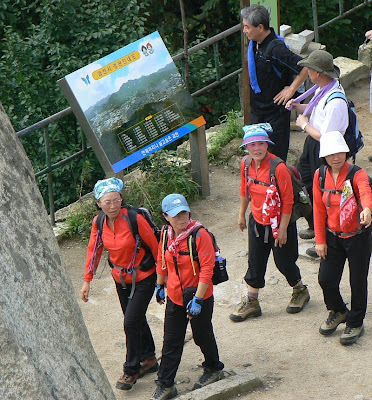 I was amazed at the enormity of the task undertaken by these women. They eventually covered the entire field with these small pieces of turf. 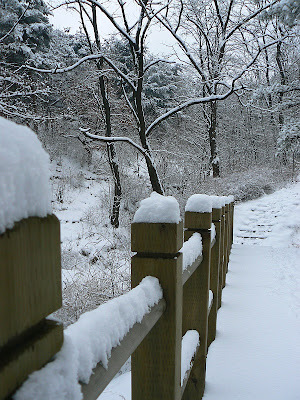 A bridge on the lower slopes of Kwanaksan after a heavy fall of snow a couple of weeks back. 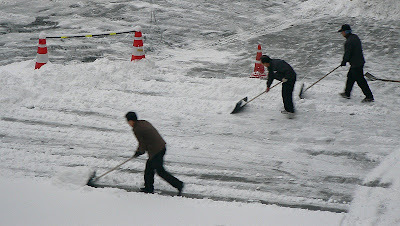 Workmen cleaning the snow away from the front of the Woonjin building, SNU Research Park. 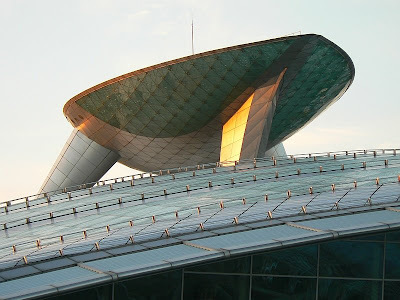 An unusual structure on top of one of the pavillions at Incheon Airport. 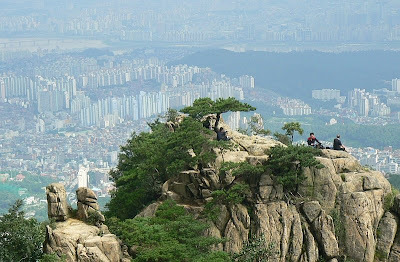 Hikers atop a peak just below Mount Kwanak (Kwanaksan), near Seoul National University, with the Han River in the distance. A young model poses for photographers at a display of new Daewoo vehicles at Yongsan Station. 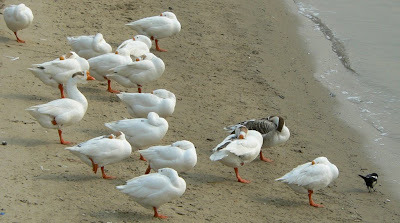 A flock of what look like geese (I'm no ornithologist) resting on a small sandy beach early one morning on the Han River, east of Ichon. One bird appears to be keeping watch while a possibly confused Korean Magpie joins the flock. 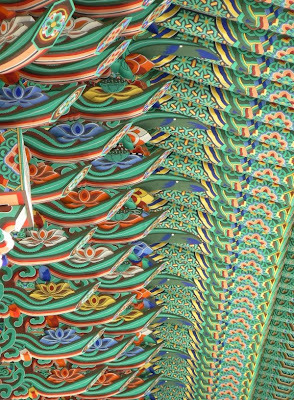 Under-roof detail of the entrance gate to Jogye-sa Buddhist Temple Gyeongji-dong, Jongno-gu. 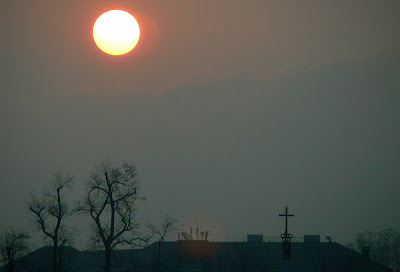 Sunrise as seen from the bridge at Dongjak. This image was blended from a set of three. Although taken on a tripod there was a lot of vibration caused by traffic on the bridge and a strong breeze.